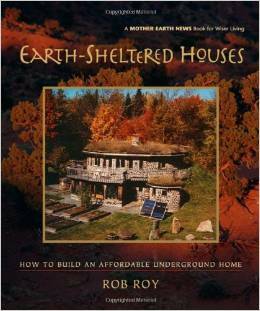 I am reading this very interesting book as part of my investigation into building a Sustainable Eco House (Earth-Sheltered Home). Advantages: The author explains the thermal advantages of building an Earth-Sheltered house, in both summer and winter weather. The first 10 feet below ground level is very slow to heat up and cool down. This “thermal lag” saves a lot of energy cost for the Earth-sheltered home. The temperature in the first 10 feet of soil in most of the USA varies from about 40 degrees Fahrenheit in winter to 60 degrees Fahrenheit in summer. In the winter, the soil outside the walls of the Earth-Sheltered home is about 40 degrees, even if the temperature of the air above ground is below freezing. So the Earth-Sheltered home only needs to be heated up 30 degrees to be a comfortable 70 degrees inside. This requires much less fuel to heat the house than if the home was built on the surface. In the summer, the Earth-Sheltered home does not require air-conditioning. The earth outside the walls is about 60 degrees, and even if the air temperature above ground is very hot, the underground home will remain comfortable inside. Insulation: The first few inches where plant roots aerate the soil has good insulation value. The Earth roof also holds snow much better and the snow provides additional insulation. Drainage: The water runoff is slow and natural. It must fully saturate the earth roof before water drips off onto the ground around the house. A “curtain drain” or surface drain can carry the runoff away from the home. Aesthetics: It looks nice, especially with wildflowers growing on it! Cooling: The living roof stays nice and cool because of the shading effect of plants and the evaporation of rainwater. Longevity: The living roof is not damaged by the ultraviolet rays of the sun, wind and water erosion, and the freeze-thaw cycle. The water-proofing membrane under the soil is non-biodegradable, and should last 100 years. Ecology: Instead of a lifeless black tar-scape, the plants growing on a living roof replace your home’s footprint with cool green oxygen production. Protection: The living roof provides some protection from fire, radiation and sound. 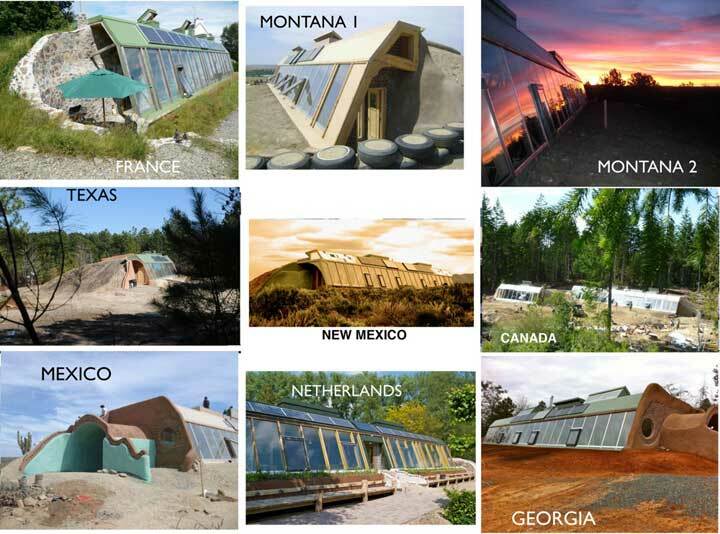 The earth roof can also provide some protection from tornado, hurricane and earth-quake. Home Design: The author suggests using simplicity of design in the home, and consistency of structure style and line. The floor plan should be integrated with the structural plan. South facing windows provide more passive solar light and heat. Earth-roofed homes should have a very shallow pitched roof. The Earth-Sheltered home needs insulation around the entire outside of the structure, and underneath it. Without insulation the 40 degree winter soil temperature will wick the heat out of the home. Also, moisture from the earth outside will cause condensation inside the Earth-Sheltered home. The author recommends using extruded polystyrene as insulation around the outside of the underground home. In a warmer climate, thinner insulation can be used. Earth Sheltered homes can be all the way under the ground, partially under the ground, or built on top of the ground with earth berms up against the sides. Research shows that a home halfway submerged in the earth has 90 to 95 percent of the energy savings of a house that is fully underground. Having the home halfway underground makes it possible to get more light by placing windows at ground level. The author points out that in order to get a building permit, your home will need sufficient entry and exit doors, and windows large enough to climb out if there were a fire. So in other words, a Hobbit House hidden completely under a hill is not going to be approved for a building permit. PreviousTiny House Rafters are in Place! NextMy Well Cost Is Paid Off!